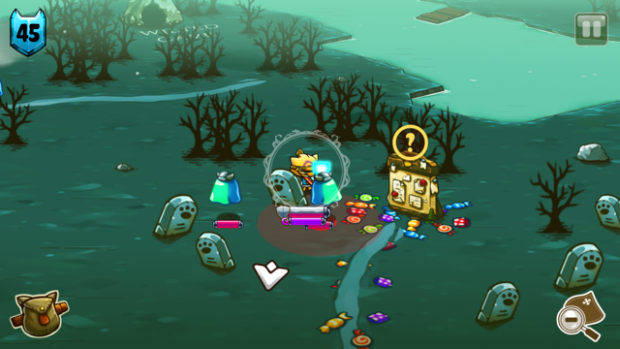 We’ve had our teeth sunk into Cat Quest ($4.99) here at Touch Arcade Towers for a while now. It’s been just about a year since one of our first looks at the game at TGS 2016. Since then we also took a peek into the dev process Gentlebros went through to cook up this Action-RPG offering. A lot of times our Patreon supporters will ask us about games that shape or define a genre, and Cat Quest, for all its levity, has left an indelible paw print on that list. Cat Quest is a beat em up dungeon crawling world travelling dragon killing game where you have to level up and find the loot that lets you kill the boss and save the girl. This is of course in a world inhabited by anthropomorphic cats set in a classic fantasy swords, spells, and staves backdrop. You have access to numerous small towns that each have their own concerns and tasks that a young enterprising feline can take up to gain further experience and gear. You don’t need much of a tutorial to pick up Cat Quest and just start smacking around enemies. In fact, it may be one of the most simple games I have enjoyed playing on my iPhone. Everything about this game is streamlined into just the essentials. Plot: You are a cat with a sister who gets kidnapped. Save her. Controls: Tap to move and attack, hold down to select spells. Setting: Cats vs. Dragons. What should strike you about this game is that for all of this, the game avoids being a one-note monotone experience. The game never feels thinly formulaic even though the core components are anything but complex. So what is it that sets this one apart? The first thing that strikes you on opening this app is that the feel of this game is incredible. The sappy bombastic adventure music, the weight of movement and combat all combine to an amazingly epic environment. I am not one to gush over how a game looks, but this one really strikes a chord with me. I still have Wizards and Wagons installed and still love it to death and Cat Quest feels like the answer to the question, what if I could go out and explore a world that looks like that? Rather than simply riding on a rail from town to town, you get to go out and explore and conquer the wild areas of the map. When you get out there and come face to face with the enemy, combat animations feel intensly satisfying when you blow up an enemy or hack them to pieces, the sounds and sights are just a pleasure to behold. Of course Wizards and Wagons has a whole lot less cats, but they can be forgiven I am sure. Combat feels like it was made specifically for mobile, and that is because it kind of was. For this release, mechanics from the PC version like dodge rolling and spell casting have been pruned. These changes allow you to play the game with a single finger without need of action or directional buttons bolted on to the user interface. This means that the user interface is really minimal. You have a simple inventory and spell selection screen, map, level indicator and settings button. Part of the reason the game looks great is that there is SO MUCH screen property dedicated to the action in the game itself. There is no longer a dodge roll but reaction time still feels like you have enough time to avoid damge, and spell casting now has a menu that shows up if you tap and hold your finger on the screen. While some Steam gamers have come out to say that the game is too easy with PC controls, I think difficulty is perfect on mobile. Some enemies have simple melee attack circles that show up around them while most have more complex attacks that are telegraphed by intricately designed spell indicators. These large templates are truly terrifying when you feel surrounded or trapped in a corner. Overcoming powerful monsters bestows this wonderful feeling of accomplishment once you learn the timing of the spells and how you need to approach each enemy. I won’t comment too heavily on the story of the game, but rest assured that any cat jokes you would have expected in this review are missing because Cat Quest is a vortex of cat jokes. I would be doing the game an injustice by trying to shoe horn in even a fraction of the puns, intentional misspellings, and cat talk that pervades this title. The plot starts out as a very basic guy saving the damsel trope but side quest story arcs and wrinkles along the way help smooth out the experience. Did I mention the cat jokes? You literally have a navigator cat spirit that follows you and probably can’t go more than a sentence or so without one. Once you get your bearings, the game revolves around the different story lines you can involve yourself in and the loot you can discover from dungeons, win from quests, and buy from the armor shop in game. The gold you collect can be spent on inexpensive small chests containing nominal gear or upgrades or large chests that contain special items or upgrades to loot that can only be gotten from completing key story line missions. I’ve personally been investing in the big ones but there is not a clear winner and at the end of the day a lot of gear decisions will radiate out from what type of a fighter you want to be. Do you want to cast spells, swing a big sword, or take a few hits without blinking an eye? Of course you can mix and match but whatever gear you choose, your cat will probably look just adorable. The hat selection in this game is quite fantastic. 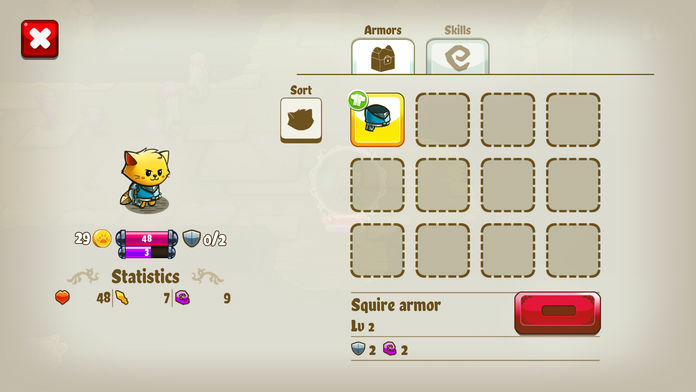 One hope I have is that future content will be added to Cat Quest to expand even further the types of hats you can find and maybe even a transmogrification system to let you have stats of one piece of equipment with the look of another. I mentioned earlier that Cat Quest feels like a game with mobile as its main target audience. Even though the Steam version has been out for a while, to me this was not a PC game that got ported, but a mobile game that ended up with an incidentally wider release platform. There are so many principles of mobile game design in practice here that either it was a happy accident or this was built to be a mobile smash hit. The controls, the pick up and play, even the light-hearted setting all play well into what mobile gamers flock to. Nothing about this game forces you into obscure menus or long drawn out quest text. Towns were designed to be a part of the world map with no loading screens required to enter them and each one contains a save point. Dungeons can be completed within minutes. So many times you play an RPG on mobile and you think to yourself, oh I need to spend several minutes organizing my inventory or I need a few minutes to stop what I am doing. 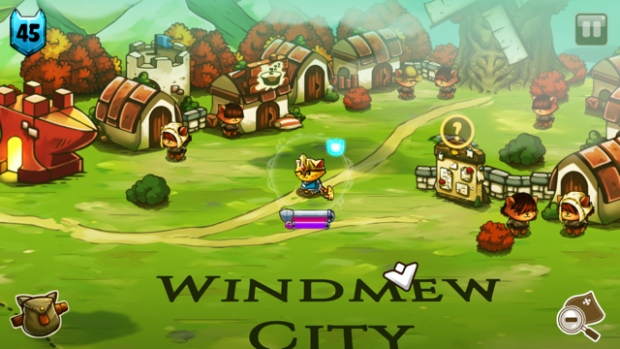 You never get that feeling playing Cat Quest and while it is simple and it feels like it could be generic, it’s exactly what an RPG on the go should be. At $4.99 you’re buying a game that we’ll be telling people “this is how you make a mobile RPG" next year, the year after that, maybe for a really long time.